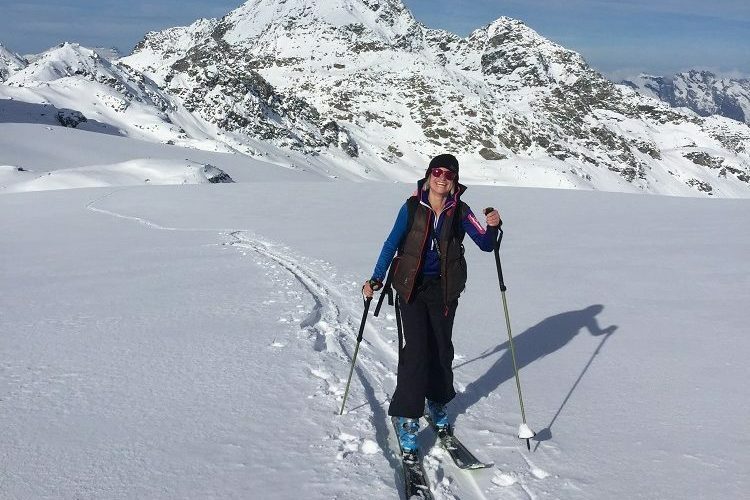 Home » How good do I need to be to start ski touring? A very general guide is that if you are comfortable skiing on red slopes and can also manage gentle moguls and ice with a little off-piste, then you are probably fine to start to do some gentle ski-touring routes. TIP – When ski touring you are quite likely to experience varied snow conditions. It is best to be prepared and confident in all conditions to help avoid any injures. Skis used for touring range from very light models intended for maximum uphill mobility and speed, to more freeride designs which are slightly heavier but offer the advantage of some extra ski under your foot for the descent. Skins are pre-cut sections of material (usually mohair or synthetic) that stick to the bottom of your skis and allow you to travel uphill without sliding back down. Clips at both ends of the skin and a sticky, non-permanent glue keep each skin attached to the base of your ski. Bindings for touring are slightly different to alpine bindings, as they allow you to lift your heel when skinning, or lock this down for the descent. They come in two types, frame bindings or pin bindings. Pin bindings are more lightweight but also require specific boots with pin connectors. You will need frame bindings if the boots you intend to use do not have these connectors. Touring boots are lighter than regular ski boots and feature a walk mode that allows the cuff to pivot freely for better range of motion when you’re hiking and skinning. TIP – Be sure you are getting boots that are compatible with your bindings. When ski touring you will often be entering uncontrolled avalanche zones. For your own safety and the safety of other skiers its essential that you have the correct safety equipment and also the knowledge of how to use it in an emergency situation. Without an avalanche transceiver, probe, and shovel you will not be able to search for someone buried in an avalanche, and no one can find you. TIP – Practice using this safety equipment – Grab some friends, go out in the snow, and bury some packs with beacons in them to practice your search skills. Where to go and what snow can I expect? When you first start, it’s advisable to always do up and down tours as opposed to loops or traverses. That way you will be able to study the terrain you will ski back over and follow your own tracks back down. As you become more experienced you can start to plan different more challenging routes. Having some experience of map reading will be crucial as the routes become more complex. Before you head off in the morning, always make sure you plan your route and remember to take with you a compass and map! Finding good snow, and more importantly safe conditions, requires experience and knowledge of the mountains. To stay safe it is advisable to go with experienced ski tourers or hire a mountain guide to help develop your knowledge. TIP – In the spring conditions never set off too late in the day – if touring at the end of the season in May you might need to start at least an hour before sunrise in order to find some good snow on the way down. The Altitude winter company portfolio includes the ski and snowboard school, the Futures instructor training programs, and Freeride Verbier a new school dedicated to off-piste coaching in Verbier.